Dressing tables, the beauty of the bedroom. We have dressing tables in many different styles to suit everybody’s interior designs. Expanding from the classic styles right up to the contemporary designs, we even have full dressing table sets. The dressing tables offered also have a wide range of materials and finishes, including natural wood like the solid oak, mirrored glass and white or black painted. These splendid dressing tables will give your room attitude and personality, all of which is decided by you. Reflect your style with the a stunning brand new dressing table. If you are looking for bespoke bedroom furniture, we have a stunning collection of dressing tables for your perusal. Whether you desire a classic white dressing table or a 50's style mirrored dressing table, we can accommodate your needs. Browse our coveted range of furniture online at your leisure. We understand that every home décor project is different, that’s why we provide our customers with one of the largest collections of dressing tables on the web. 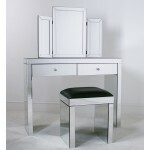 We can supply you with everything from a classic white dressing table to a contemporary mirrored design. One thing that all of our products have in common is quality. Our bedroom furniture is both durable and stylish so you can rest assured that your white dressing table will stand the test of time. Our unique products can add an air of sophistication to your home whether you prefer classic or contemporary décor. Trust Dooley’s Furniture for a perfect mix of affordability and style. It couldn’t be easier to shop online for all of your furniture requirements here at Dooley’s Furniture. Simply add your white dressing table to a virtual shopping basket and click to purchase. We strive to provide our loyal customer base with an enjoyable online shopping experience that makes purchasing bedroom furniture a breeze. Shop online with us today.